Slate says you’re all lazy readers, and honestly, we’re not surprised. You’d be lying if you said you read 100 percent of all the articles you open up online. Argue if, the Slate conducted a small scale test to prove that few of you actually read anything from top to bottom. When our editors say the lede, or the top of the article really matters, they’re not kidding. 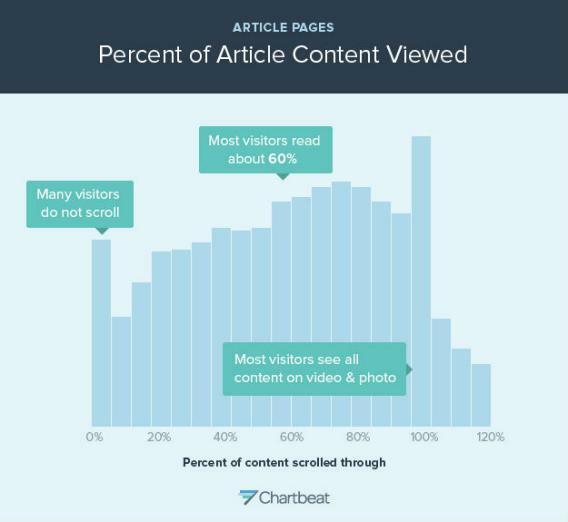 Contracting a data scientist from Chartbeat to analyze how much of an article Slate readers will read through, Slate not surprisingly discovered that the majority of visitors will just scroll through half of the page and be done with it. Other readers may get to the top section of the article and surprisingly not even bother to scroll through the article. For the Slate article in particular, that would mean readers would just see half of the header photo, the title and the excerpt. Note that the study excludes readers that have bounced from the page, meaning that only readers that ended up engaging with the page in some way are represented. People who simply opened and closed the page are not. Interestingly, the study suggests that people will tweet articles even without having completely read through the entire piece. While Chartbeat doesn’t have the technical capability to figure out what types of readers ended up tweeting the article, it went for the second best option – charting the relationship between the number of tweets to the number of people who read the entire article, and another chart for scroll depth (how far down the article a reader has gotten down to) verses Twitter activity. As you can see from Chartbeat’s graphs, there really isn’t much of a relationship. That goes to show, that readers will tweet the article regardless of how far they’ve scrolled down the page. If you’ve made it this far – congratulations! But don’t worry, we’ll be OK if you tweeted this article without finishing it.